Few things in life are as delightful and comforting as the steaming folds of a slice of cheese pizza. And now, the greasy glow of a perfect slice can lull you to sleep, or perhaps a food coma, as a night light. Designed to look just like a delicious slice of cheese pizza on a white paper plate, the novelty light sells for just $6 -- the cost of at least two slices of real pizza depending on where you live in NYC. It's perhaps the perfect beacon to help guide you from your pepperoni pizza bed to your fridge for midnight pizza leftovers. Or it might just make you wake up craving pizza even more than you already do. Steph Mantis, the artist who designed the pizza night light, said pizza has always been a huge part of her life, having grown up at her family's pizzeria business, working at another pizzeria while in college, and more recently, eating countless slices as a New Yorker. She said it's a "quiet nod" to her first NYC pizza experience at Luigi Pizzeria in Brooklyn, and admits, "After I took the photo, I definitely ate the slice." 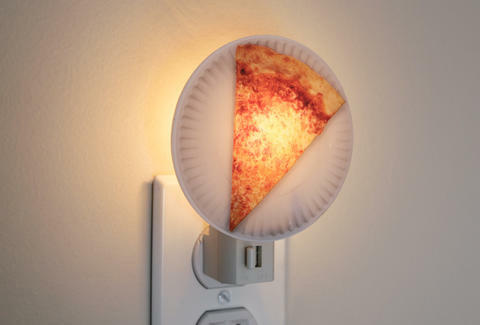 And what better way to drift into pizza dreams than with a pizza nightlight? Tony Merevick is Cities News Editor at Thrillist and might have to get one of these things... for his desk. Send news tips to news@thrillist.com and follow him on Twitter @tonymerevick.